Having previous with Bianca Butcher would put most women off a man, but when Ray arrived in the Square, heads turned regardless. Ray's a decent guy. He loves being in the gym, the pub and the football terraces. Although he had a hard childhood, he was always loved by his grandparents and mum. The two things he took from his childhood was a love of good Caribbean food – chiefly his nan’s recipes – and a special kind of optimism from his granddad. Ray joined the army, but not before he got a girl from his estate pregnant. Although he now sees his daughter as being the best thing in his life, his relationship with her mum isn't the best. He's worked from city to city in various pubs, mostly in the kitchen - he's a great pub chef. When it comes to the ladies Ray has no problems drawing them in. He did start to fall for Bianca when they lived in Manchester, but he was cut out of the picture when Tony came into her life. Now Ray's dedicated to getting to know the son he never knew he had - Morgan, when he has the chance. Good looking Ray caused quite the stir when he appeared on the Square, but it was the vivacious and curvalicious Kim Fox who got his notice. But after snogging her sister Denise, Ray realised that his heart was no longer in the relationship, and broke things off with Kim, leaving her devasted. Ray helped out old flame Bianca with her problems with Liam, attempting to be the father figure he thought Liam might be missing. But then Ray had his own problems... his daughter's Sasha's mom had been in an accident meaning Ray has had to quit The Vic so he had more time to help out. Luckily, ex Kim was on hand to help him and spending time together made them both realise that their relationship might be worth giving another go. But then Ray dropped the bombshell that his family sitaution meant he had to leave The Square. A loved up Kim initially volunteered to go with him but after realising at their leaving party that Ray would constantly want to change her and make her more classy, Kim decided it was best to stay put and finally let Ray go. Chucky's big break came when he got the role of Curtis Alexander on Dream Team. 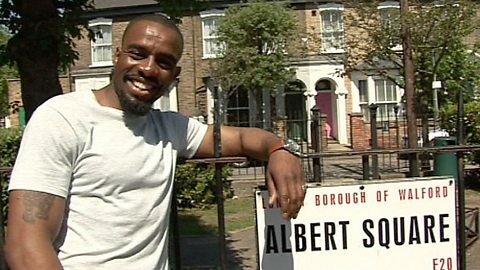 He's also featured in Holby City, Footballers Wives and The Bill. Chucky's stared in Blockbuster films such as 'Bourne Ultimatum' and 'Batman: The Dark Knight'. In theatre Chucky's appeared in Olivier nominated hit plays and musicals such as 'Annie Get Your Gun'. We catch up with the man behind Ray to talk about his cool connections in the film world!